Welcome to Silver Hawk Aquatics! Please complete the following registration form. All discounts (multi-child or multi-session) will be applied at check-out in the parent portal. Please log-in to your parent portal account to submit your registration payment after completing this form. officers, directors, and employees, from liability from injury or cost incurred from participating in this program. Silver Hawk Aquatics determine cancellation of lessons due to weather or other reasons beyond our control. 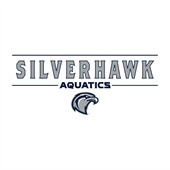 Thank you for signing up for Silver Hawk Aquatics Swim Lessons! We would like to take this opportunity to answer some of your concerns. We don't want to seem abrupt by any means...we just want to clarify some items in order to keep everyone on the same page. Communication is key to our success and our swimmers are our #1 priority! 30 Minute Lessons-For children 5 and older who already know how to swim and are comfortable in the water and are progressing to learning strokes. 15 Minute Lessons-For all non-swimmers age 18 months and up, or less proficient swimmers. Each lesson is 15 minutes in duration. The S. A. program is based on mastering the skills of competitive swimming strokes in a sequence of stations. Each station is reviewed daily prior to progressing to the next one. In that way, we use repetition to thoroughly master each skill of each stroke. At the end of each lesson session, a certificate is given noting which of the 10 stations have been mastered. Our swim lessons start at 18 months of age. All non-swimmers are required to take 15 minute lessons until they are swimming independently and comfortably in the water. We will be evaluating all swimmers on the first day to be sure that each swimmer is being taught at the appropriate skill level. 15 Minute Lessons- Please understand that almost all non-swimming children in our 15 lessons will cry, some more than others. This is typically out of fear and an unfamiliarity with the surroundings or the coach, and not from the mistreatment of the child. We recommend at least 8 lessons for our non-swimmers. Back to back sessions are preferred for consistency. Infants and toddlers must wear swim diapers if not potty trained. Please provide a swim suit, towel and goggles for your child. Goggles are not encouraged for our non-swimmers or children under the age of 3. If you have any questions, please feel free to contact us at lessons@silverhawkaquatics.com. Thank you for your trust and communication! MAKE UP-Make up lessons are scheduled ONLY in the event that Silver Hawk Aquatics cancels a lesson due to weather or instructor illness. Make up lesson times will be scheduled by Silver Hawk Aquatics. Weather- Many times the weather interferes in the running of our lesson program. Please follow this simple guideline: We will always have lessons unless there is a threat of lightning near our facility or it is raining too hard for us to function. Keep in mind that just because it is raining where you live it is probably not raining at our facility and we will have the lesson. Only Silver Hawk Aquatics managers can call off the lesson. Schedule Changes: Please be sure to schedule your lesson carefully. While we will make every attempt to accommodate schedule changes after you have registered, there are NO REFUNDS. In the event of inclement weather, please visit our website silverhawkaquatics.com for updates on cancellation of Swim Lessons. In the event that we cannot use the pool due to a cancellation for inclement weather, makeup lessons are scheduled on the Friday of your swim week. If you are unable to attend that day, you may be allowed (1) additional day to make up your lesson the following week. If you are unable to attend that day, the lesson will not be rescheduled or refunded. ONLY lessons cancelled by the instructor will be made up. If you choose to miss a lesson, no makeup lesson or refund will be offered. If swim lessons are taking place in the water and inclement weather occurs, only the time left in that lesson will be made up. Not an additional 15 or 30 minute lesson. If you register and pay for your child's swim lessons but do not show up or call to reschedule by noon on the Friday prior to the lesson beginning, you will not receive a refund or credit. To maintain quality class management, parents are asked to sit and observe lessons from the designated seating areas located around the pool. Please do not sit on the edge of the pool or follow your child/instructor around the pool facility. If you have questions about your child's progress, please approach the instructor before or after the class has finished. He/she will be happy to answer any of your questions. If an instructor is unable to answer your questions, you will be directed to someone on our staff who can assist you. Parental involvement- We welcome all parents to watch and enjoy the lessons but ask that you do not interfere by sitting at the edge of the pool, and/or talking to your child during the lesson. Please direct questions to the lesson supervisor. Have your child arrive at their scheduled lesson on time so that they do not miss or distract from other children in the pool. Always be encouraging and positive toward your child. Swim America (S. A.) instructors are called coaches and are certified to teach by the program director. Silver Hawk Aquatics S.A. Coaches' training involves over 8 hours of classroom time with study from the S. A. manual, video aided instruction, and 20-40 hours of actual hands-on training as an assistant to an S. A. certified coach. In addition, almost all of our coaches were or currently are competitive swimmers with 4-10 years of experience. This swimming background gives them unequaled knowledge of swimming strokes as they themselves have been instructed for years. Lessons and instructors are booked on a "first come, first served" basis. We do not pro-rate any week or session. To request an instructor (or a certain personality), please mention it in the "comments" section of the online registration form or with a staff member while registering in person. If you register and pay for your child's swim lessons but do not show up or call to cancel 72 hours in advance, you will not receive a refund. I understand that photo(s) of my child(ren) may be taken during swim lessons, summer swim league, splash camp or Saturday splashers and may be used in future publicity or on the Silver Hawk Aquatics website.